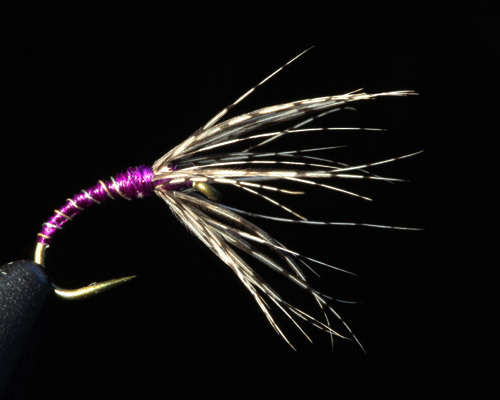 Jay says, “The story behind my flies is a simple one. Four years ago, or so, a friend tried to get me to tie flies and I even took a series of classes… A recent fly-fishing trip to Puget Sound brought my interest back up a bit and I discovered tenkara fishing as a simpler alternative to what I’ve done in the past. This idea fits very well into my psyche. Most of the flies I’ve seen tied for tenkara fishing appeared spare but effective so I decided to try tying once again. The pattern I’ve sent was based on this idea with some of the materials I purchased when I first tried to learn. Including these flies, I’ve tied less than 100 flies total so I’m just beginning to understand the techniques involved. Next I’ll need to better understand how changes to the patterns affect the behavior of the flies.” Great fly Yakfisher! I really like it. MikeM from the forum tied the fly above, and wrote, “I am pretty much a traditional fly tier and have been tying longer than I have been fly fishing. Therefore I am far from a “one fly” guy. I really respect those that go this route, but I am a biologist and a bit too much of a geek about the entomology side of things to give up hatch matching. So I thought about what I would want to incorporate from what I have learned of traditional western fly tying if I could only use one simple fly. 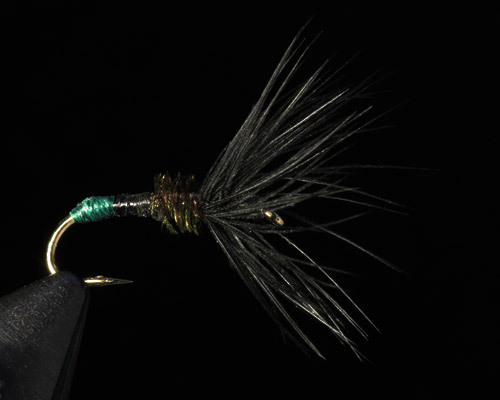 That fly would have to be a soft hackle wet fly as they are versatile and always seem to work well for me. One color would be tough to choose, but it would likely be either olive or purple. I went with purple because of the idea that it is more recognizable in deeper water. I strongly believe that segmentation is important, so I had to give it some type of rib, and figured that a little flash from the silver wire might act as a trigger. Finally, I choose the light partridge hackle because it provides a bit of contrast and the banding in the barbs provides a “buggy” look. I put all off this together and used the reverse hackle in homage to the traditional Tenkara style. I’m looking forward to hearing if anyone has success with this pattern.” Nice going Mike!